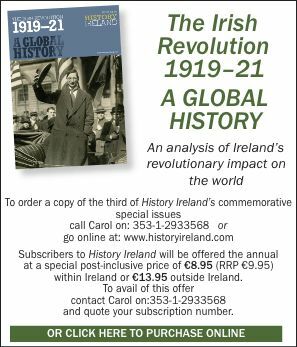 This publication presents the essays from the 30th biennial Irish Conference of Historians, which was held at NUI Maynooth in 2011 with death and dying as its theme. It provides fourteen essays by expert historians and archaeologists and makes a welcome contribution to the understanding of how death and dying were experienced, responded to and interpreted. The experiences of death and dying can bring many social practices into sharp relief and in so doing have much to say about past attitudes and societies, in addition to offering insights and reflections for the present. The volume offers a number of fascinating intersections between disciplines and opens with a broad sweep through time—8000 BC–AD 500—and a focus on life and death in prehistoric Ireland. In this essay Gabriel Cooney explores broad patterns and trends over this extended period, emphasising the significance of the ancestral dead and the way in which the dead continued to shape and influence their communities. The importance of the ancestral dead is also very evident in the chapter by Edel Bhreathnach and Elizabeth O’Brien on burial practices in early medieval Ireland. They present some of the results from the INSTAR ‘Mapping Death’ project, which combines archaeological, anthropological, historical, literary and scientific evidence to construct a multi-dimensional image of life in Ireland at this time. In throwing light on the social practices and social hierarchies, they reveal how the ancestral burial mounds were utilised as boundary-markers and played an important role in early Irish law in relation to claims of territory. Sarah Tarlow’s intriguing exploration of the journeys of the dead bodies of two major figures in seventeenth-century Ireland—Oliver Cromwell and Oliver Plunkett—documents the changes in their treatment over time. Vanessa Harding provides a profoundly interesting examination of death and the family in early modern London. Drawing on wills, testamentary cases and personal writing of the time, she explores the tensions between the idealised death as prescribed in the literature of the ars moriendi and the majority of deaths, which, in reality, were more varied and probably more disorderly. As a sociologist I was particularly drawn to David Lederer’s essay on ‘Suicide statistics as moral statistics: suicide, sociology and the State’. Suicide statistics were a foundation of sociology from its establishment in the nineteenth century, and Emile Durkheim, considered by many to be a founding father of the discipline, utilised suicide statistics to demonstrate his sociological method and to confirm the quantitative methods for measuring and establishing the existence of social phenomena through demographic analysis. Nevertheless, as Lederer establishes, the measurement of social phenomena remains a largely qualitative undertaking that involves value judgements particular to specific times and places. Suicide is also the focus of James Kelly’s essay, in which he considers suicide in eighteenth-century Ireland. He draws on a sample of 675 cases of suicide and parasuicide reported in Ireland to provide an outline of some of its main features and to explore the varying responses to these acts. Drawing on the results of the Death and Funerary Practices 1829–1901 study, based at the University of Limerick, Ciara Breathnach and David Butler’s essay on ‘Death notices and obituaries in provincial Irish newspapers, 1820–1900’ demonstrates just how much death and death-related practices can reveal about life—in the past and in the present. Mining over 157,000 notices to establish their nature and function, their analysis brings to the fore two striking features: that the growing popularity of the death notice at this time was an expression of rising middle-class Catholic aspirations and that it facilitated the Catholic Church in exerting greater control over funerary culture and practice. 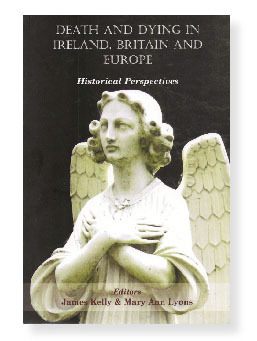 This volume is rich and varied, with a wide range of contributions, including Eunan O’Halpin on ‘Problematic killing during the War of Independence and its aftermath: civilian spies and informers’; ‘Death, dying and hunger strike’ by William Murphy; ‘Wandering graveyards, jumping churches and rogue corpses: tolerance and intolerance in Irish folklore’ by Clodagh Tait; ‘Varieties of Irish famine deaths’ by Cormac Ó Gráda; ‘Rethinking death in the year II: the dechristianizing of death in revolutionary France’ by Joseph Clarke; ‘Forgetting to remember Orr: death and ambiguous remembrance in modern Ireland’ by Guy Beiner; and finally, right up to the most recent past, an examination of ‘The mutations of martyrdom in Britain and Ireland, c. 1850–2005’. A most impressive line-up and a most impressive volume. Una MacConville is a sociologist and a Visiting Fellow at the Centre for Death and Society (CDAS) at the University of Bath.